With All Saints' Day fast approaching, there is no better time to get some new ideas for teaching about the saints. Teaching about the saints doesn't have to just be reserved for November 1st. Saints studies are perfect all year long, and now more than ever they are accessible for younger students too through books, videos and hands on learning activities. I've rounded up some ideas for ways that you can add more to your saint studies with your students or even your own children. 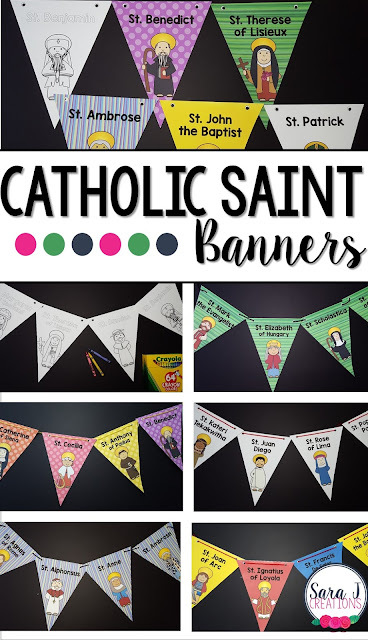 These Catholic Saint Banners make the perfect decorations for Catholic classrooms, hallways, schools and churches. With different color options including a blank option for students to color, there are so many possibilities. This would be great to add a new saint to the banner each time your class learns about a new saint. Or add them on their feast day. There are so many different ways to use these cute banners. Catholic Saints Interactive Notebooks are a way to learn basic facts about different saints in an easy and hands on way. These can be made into trading cards, flipbooks, notebooks and more. Each saint has a few basic facts plus feast day, what they are the patron of, and the virtue associated with him/her. There are also posters that can be displayed around the room. 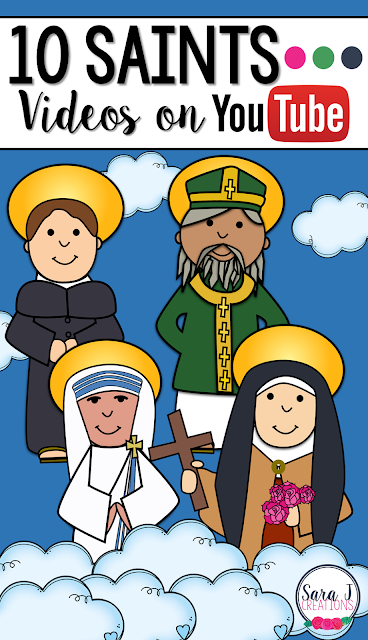 Coloring books are a great way for students to learn basic facts about each saint. For the included saints, there is a short section about his/her life, virtue, feast day and what he/she is the patron of. Pick the saints you want to study and bind them into a coloring book. There is a free sample of this if you want to try it out - click the link below. Sometimes you just need a video to engage your students who are growing up in a media dominated society. 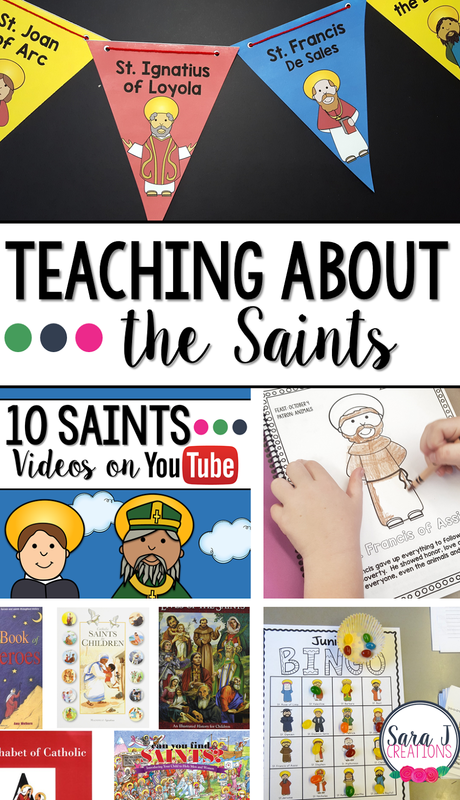 This blog post includes 10 videos about saints (mostly cartoons) that would help teach about the life of the saint to your students. I found this Catholic series of chapter books and fell in love. 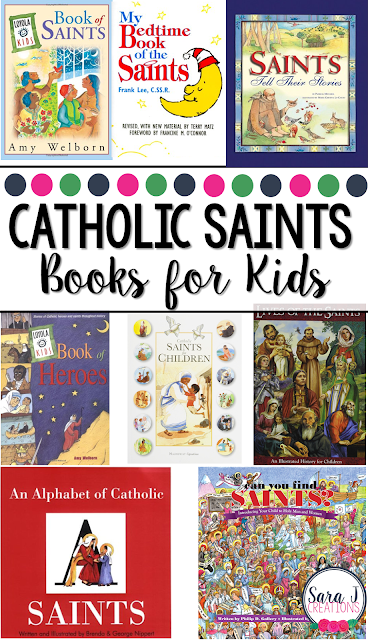 Not only is it awesome to have a Catholic chapter book that is fun and modern and completely relatable to kids, but it also focuses on different saints in each book. Students get to travel back in time as they read (or listen along) to meet and walk in the footsteps of a saint. I've reviewed 2 books in the series on my blog, but there are several others in the series, too. Make learning about the saints even more fun with games!! Bingo and Bingo Jr. are a great way to review saints. This is the perfect game for your All Saints' Day celebrations. Reading books are a great way to share the stories of the saints. In this book round up, I found books that taught about multiple saints in short, easy to understand formats.